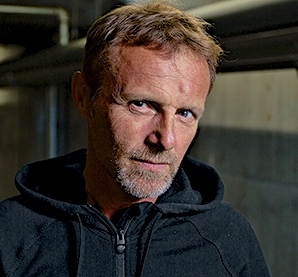 Note: Jo Nesbo was WINNER of the Peer Gynt Prize in 2013 for his contributions to Norway. Author photo by Brian Howell. Without a place to stay and desperately in need of sleep, he goes into a small church, takes some vestments from a closet to wrap around himself for warmth, tries unsuccessfully to swallow some communion wafers for food, and curls up on the floor. Ironies abound. A young child, Knut, wakens Ulf and announces that he can’t sleep there because his mother has to clean the place. His mother, Lea, overhearing, says that if he needs a place to stay, “You just have to knock on a door and they’ll give you a bed.” Working as both sexton and vicar in the church, the boy’s mother offers him the use of her husband’s hunting cabin, since her husband is out fishing. With a rifle supplied by Knut’s mother, and plenty of money brought with him from his job with the Fisherman in Oslo, he is able to buy food from a vendor in town and settle in, often attended by the lonely Knut, who enjoys his company. 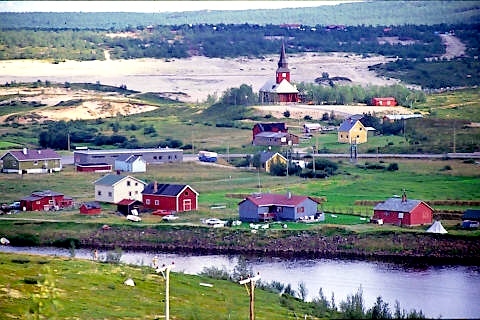 Kasund is a “suburb” of Kautokeino, pictured here. Nesbo’s new, more concise style is seen in his ability to create mood and atmosphere through description, while also revealing character and background through point of view and dialogue. “The scenery which had looked so monotonous from a distance was constantly changing, from soft, earthy browns covered by green and reddish-brown heather, to stony, scarred lunar landscapes, and suddenly – in the light of the sun…like a red discus – it looked like it was glowing, as though lava were running down the gently sloping hillsides…” As Ulf and Knut are walking through this scene, young Knut is creating unfunny jokes and trying to become a buddy with Ulf, and Ulf is asking innocent-seeming questions of him to familiarize himself more fully with the landscape, native plants, and animals so that if/when the Fishermen’s men find him, he’ll have a better chance to save himself. 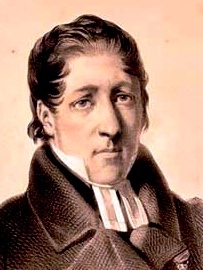 Lars Levi Laestadius, founder of a fundamentalist religious group based on Lutheranism. For the first fifty pages, the reader accompanies Ulf as he tries to assess his options if/when the Fisherman’s men arrive. Nesbo’s honest and appealing point of view and characterization for Ulf show a kinder, gentler Nesbo, featuring a “fixer” who is in touch with the natural world and connecting with a young boy, and eventually his mother, the vicar, a situation in which the ironies are unexpected. Through flashbacks and memories, the reader learns about Ulf’s background in Oslo, his pre-criminal life there, and his hopes for the future, eventually discovering why Ulf ended up as a fixer. At the same time, Ulf is fully experiencing life in a new world, with shamans and ceremonies, and a fundamentalist sect of Lutherans, the Laestadians, which include Knut and his mother. Though the threat of the Fisherman never leaves Ulf’s mind, he is also fascinated by what he is learning of the culture and about the nature of good and evil: “It’s only a stone’s throw from the drumming of a shaman and witchcraft to the Laestadians speaking in tongues,” their goal being “to impart the old, true creed,” a rigid, absolute belief in the nature of good and evil and a person’s tiny place in the universe. Though he likes and admires Knut, Lea, and others from the town, he is horrified by the abuse that frequently arises under the leadership of Lea’s father, the priest, who is the sole interpreter of the Word of God. Ironic parallels between this lifestyle and that of the criminal underworld of people like the Fisherman (whose own name is ironic) are impossible to miss. The Fisherman’s men do, of course, arrive, as everyone including Ulf expects, and a showdown and face-off do occur. 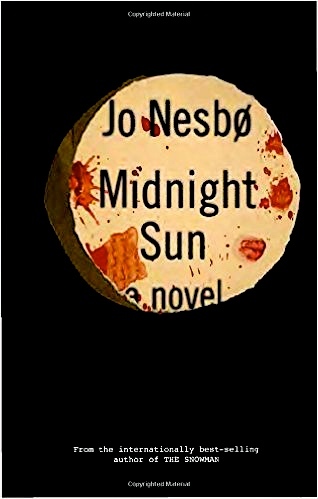 As the killers approach the cabin where Ulf is hiding, Nesbo cannot resist poking fun at the clichés which so often accompany mystery stories with their obvious foreboding and foreshadowing, and when Ulf concludes that there is only one way he can possibly escape discovery, every reader will be reminded of some of the other outrageous tricks seen in other Nesbo novels. Fans of Nesbo will easily imagine the author creating this culminating scene with a huge smirk on his face. 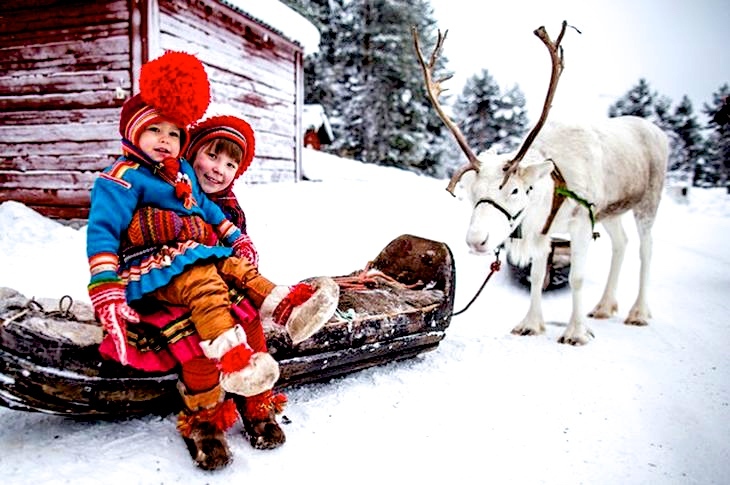 Sami children on their reindeer-drawn sled. 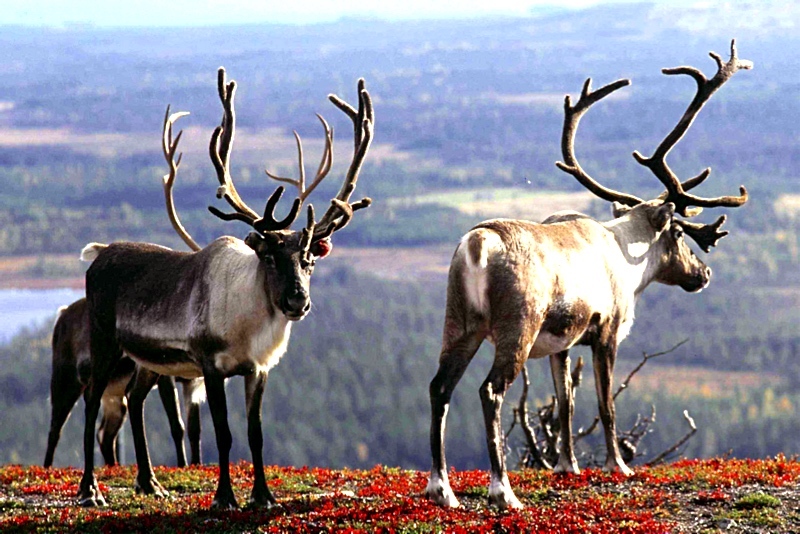 Their shoes are of traditional reindeer hide. For those accustomed to the high-octane action, bloody violence, and even horror in Nesbo’s past novels, this novel, like Blood on Snow, will come as a major surprise. Fewer than three hundred pages long, the novel focuses on Ulf’s well-developed character and the themes of what it means to be “good,” how one defines “right,” and whether life has any “real” meaning. Beautifully paced, far more introspective, and more literary than what one finds in Nesbo’s first twelve thrillers, the novel maintains high interest and plenty of excitement. With its smaller scope and its unique cultural setting in the Land of the Midnight Sun, the novel employs aspects of nature – the world of tooth and claw – to show parallels between the animal world and the world in which Ulf himself has been living. By using Kasund and the world above the Arctic Circle as the microcosm for life, Nesbo creates a novel of genuine sentiment without resorting to sentimentality, and thoughtful themes without becoming ponderous.